Heat olive oil in a large pot. Once hot, add garlic and onion. Cook until onion is soft over medium heat. Set aside 1 cup of peas to use later on. To the pot, add the remaining peas, lettuce, mint, vegetable stock, and coconut milk. Cover and let simmer until lettuce is soft- about 5-8 minutes. Transfer soup ingredients to a blender and blend well until soup is smooth. Taste soup and if needed add the 1⁄2 teaspoon of salt. Add the lemon juice and blend again. Taste. 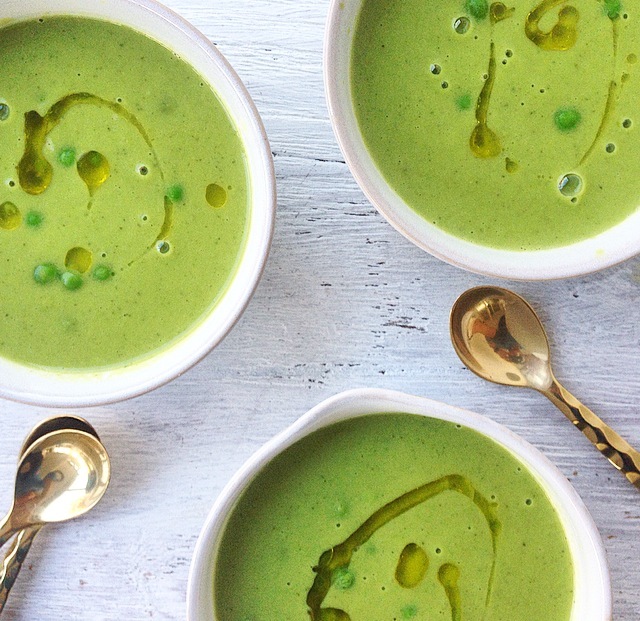 Add the cup of peas you set aside to the blended soup. If the peas were frozen, you might want to add soup back to the pot and heat for a few minutes until the peas are defrosted. Serve and enjoy!